Native Indians in America always seem to form the basis of great video slots, whether it’s the popular Novomatic land-based slots, Buffalo Spirit and Thundering Buffalo (which have both made successful transitions to the online casino). World renowned slot developer Microgaming, however, know which side of their bread is buttered, so their glossy-looking Mystic Dreams slot really delivers on all levels. This is something you might have come to expect from Microgaming slots but, admittedly, they do have a tendency to let their slot graphics standards slip with the less high profile titles. Luckily, this is certainly not the case with this release. 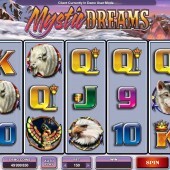 In fact, Microgaming excels on the visual front with this slot. 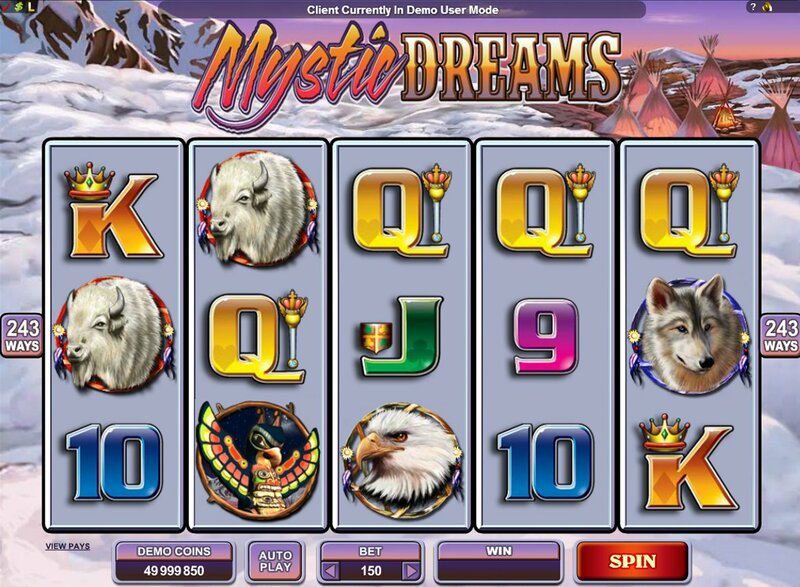 Utilizing Microgaming’s customary 243-ways-to-win pay-line system, Mystic Dreams has coin bets starting at just $0.01, some lush rendered graphics on the reels, and some gentle acoustic music over the top which evokes starry nights in America. On the reels, and accompanying the standard 9-through-Ace symbols, are Indian Chiefs, Buffalo, Eagles and Wolves. The Wigwam symbol is Wild and substitutes for all symbols other than the game’s Scatter. Free spins can be yours if you hit three or more Totem Pole symbols on the reels from left to right. Depending on how many Scatters you hit you will win 10, 15 or 20 spins. If you then hit Wigwam Wilds on reels 2, 3 or 4 during free spins, you’ll earn, respectively, a 2x, 3x or 4x multiplier on your wins. Free spins can be re-triggered so you’ll really be hoping for some nice bonus icons. Oh, and before I forget, you can win up to a multiplier of 24x if multiple Wilds form the same winning combination. This is one of those high-variance Microgaming slots which has big betting – 243 ways – but has a bonus round that’s pretty hard to trigger. There are obviously big wins to be had, of course, but you really need to hit that free spins round multiple times during a session to get some cash back. There’s a lot of American action out there, so I would stick to the aforementioned online slots plus the likes of Aristocrat's Buffalo online slot and the Buffalo Wild Wins slot from Gamesys. For free spins junkies, however, there’s certainly some joy to be had here.